Those who aren’t familiar with comic books may be unaware of the depths which the stories reach. With subplots and characters galore, they are more like soap operas than any other form of literature. Not only do characters die and come back on a regular basis, it’s not unusual for familiar face to undergo a drastic change. For years, Aquaman had been a clean-cut do-gooder who always wore the familiar green and orange costume. (Many still remember him from his time on Superfriends.) But, in 1994, Writer Peter David gave Aquaman a new persona. Now bearded and with long hair, this character had more of a gritty edge. This was the kind of Aquaman who made his film debut in 2017’s Justice League. Now, the character gets a solo mission in his own titular film. Aquaman goes back several years to when a simple lighthouse keeper, Tom (Temuera Morrison), meets Atlanna (Nicole Kidman), who had fled her homeworld of Atlantis. The two fall in love and soon have a baby before Atlanna is taken back to the sea. Years later, that baby has grown up to be Arthur (Jason Momoa), a half-human/half-Atlantean who can breathe underwater and swim at a high rate of speed. Mera (Amber Heard) beckons Arthur to Atlantis to aid in a time of peril. Orm (Patrick Wilson), who is Arthur’s half-brother, rules over Atlantis, but he longs for a war with the surface world. He has aligned himself with King Nereus (Dolph Lundgren) and hopes to persuade all of the other undersea kingdom to join him. Mera asks Arthur to challenge Orm for the throne and therefore, spare the world from a fierce battle. But, can a surface-dweller rule Atlantis? Standing in the shadows of the Marvel Cinematic Universe, DC and Warner Bros. have tried for years to get the DC films to be successful. They must be stymied by the fact that Batman V. Superman: Dawn of Justice and Justice League have underperformed, while Wonder Woman was a box-office smash. Given that, there were most likely further frustrated by the fact that Aquaman also became a hit. Why are the arguably less well-known characters from the Justice League outperforming Batman and Superman. The short answer is that while Zack Snyder, the director of Batman V. Superman and Justice League has a great visual sense, he’s not a very good storyteller and his movies lack heart. Warner Bros. did the right thing by giving the filmmakers involved in the side-stories free-reign to break from Snyder’s style. While Aquaman may resemble the other DC movies in terms of its scope, at least Wan has brought a new sense of style to the series. While Snyder’s films were painfully dark, Wan has woven in many bold colors and isn’t afraid to let some light shine in. Still, this doesn’t change the fact that the movie is simply too formulaic for its own good. The visual effects are good and it’s clear that Momoa is having a blast, but they easily could have cut 45-minutes out of this movie and it would have had the same impact. Comic book fans will geek out on the fairly authentic look of Black Manta, but one must question why the DC movies are obsessed with characters wearing armor. Aquaman may be the best of the series thus far, but it didn’t have to jump very high out of the pool to clear that bar. Aquaman makes breathing underwater believable, but not Amber Heard’s wig on 4K UHD courtesy of Warner Bros. Home Entertainment. The film has been letterboxed at 2.35:1 and 1.78:1 and the Disc contains an HEVC 2160p transfer which runs at an average of 50 Mbps. The image is very sharp and clear, showing no overt grain and no defects from the source materials. The colors look excellent, especially the brighter tones, and the image is never overly dark or bright. The depth is excellent, given a near 3D look at times, and the level of detail is notable. The Disc carries a Dolby Atmos audio track which runs at 48 kHz and an average of 3.0 Mbps. This is a very active track which really comes to life during the action sequences. The surround sound effects are nicely detailed, and we can often pick out individual sounds. The audio moves seamlessly from the front to the rear and the stereo channels show nice separation. The subwoofer effects are strong, bringing deep tones. 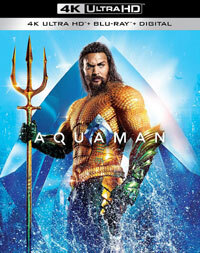 All of the extra features for Aquaman are found on the Blu-ray Disc included in this set. “Becoming Aquaman” (13 minutes) focuses on Momoa’s take on the character. Through interviews with the actor and others, we hear how he was offered the role and his enthusiasm for this part is palpable. “Going Deep into the World of Aquaman” (19 minutes) is a making-of featurette which places emphasis on the visual effects and the creation of the undersea kingdoms. “James Wan: World Builder” (8 minutes) profiles the director and shows how he tackled the challenges of such a huge film. “The Dark Depths of Black Manta” (7 minutes) offers an overview of the character hosted by Yahya Adbul-Mateen. “Heroines of Atlantis” (6 minutes) allows Nicole Kidman and Amber Heard look at how the women in the film help Aquaman. “Villainous Training” (6 minutes) takes us behind the scenes to see the work which went into fight training for the film. “A Match Made in Atlantis” (3 minutes) has Momoa and Heard discussing their working relationship. “Atlantis Fanfare” (5 minutes) examines the visual effects of the film’s finale. “Creating Undersea Creatures” (7 minutes) allows the visual effects artists to introduce the many underwater denizens created for the film. “Aqua-Tech” (6 minutes) has Wan explaining the technology which went into creating the film’s look. “Scene Study Breakdown” offers a more detailed look at how three key scenes were developed and shot. “Kingdoms of the Seven Seas” (7 minutes) has Dolph Lundgren breaking down the various kingdom which align with Atlantis.